If you hunt in a state (or states) that require you to wear blaze orange on your body and you hunt in a ultralight or backcountry style, or you rely on technical hunting clothing, then you have a blaze orange problem. Thus far, the blaze orange vest solutions offered by the vast majority of hunting focused manufactures have been more of a problem than a solution. As a result, it is rather difficult to find a Blaze Orange vest that is not some dedicated piece of “outerwear” with its own pockets and other “bells and whistles.” The problem with these garments is that they are heavy, retain moisture, do not breathe well and they get in the way of the pockets and features of your technical hunting clothing. It is frustrating to cut every corner imaginable to save ounces only to have to pack a 15 oz polyester vest that will invariably become soaked with sweat and not dry out very well. Sitka gear was even so bold as to enter a $100 blaze orange vest to the market under the guise of being a piece of dedicated technical gear. This 14.4 oz piece of uselessness champions a padded shoulder and zippered pockets. Fact of the matter is, virtually all of the hunting manufacturers have failed to listen to the demands of contemporary hunters. What do hunters want from blaze orange clothing? They want the lightest piece of fabric possible that does not retain moisture, does not get in the way of their technical clothing nor hinders athletic performance and meets the minimum requirements for blaze orange. One solution has been to use mesh construction vests, however, these are not all manufactured with ultralight ethos in mind and many do not contain the minimum surface area of blaze orange. Also, the spacing of the mesh itself can be legally problematic in certain states. In short, hunters do not need blaze orange clothing so much as they need blaze orange requirements met with as few hindrances as possible. 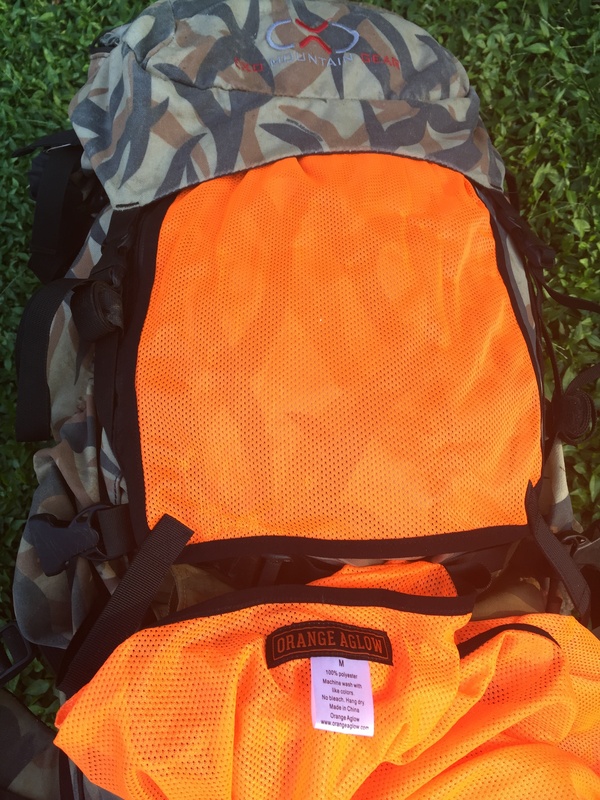 Orange Aglow, a new company started by a fellow hunter with many of complaints echoed above, offers you a straightforward, no nonsense, ultralight solution to your Blaze Orange problem. A medium vest weighs 2.2 oz, contains 600 square inches of blaze orange and costs $17.99. The fabric is an extremely tight knit mesh with a stretchy quality and will not hold moisture. Sizing is standard. If you wear a medium shirt or jacket, purchase a medium vest. The fabric stretches enough to easily fit over a puffy jacket. Should your state require visibility from all directions (there is a new video on the CO Fish & Game suggesting that you wear a blaze orange vest large enough to fit over you AND your backpack! ), this blaze orange panel is a easy solution. It weighs less than 1 oz, has 4 velcro attachments points, contains 115 square inches of blaze orange and costs $5.99. The panel could also sensibly be used to cover a skull or capped head when packing to avoid another hunter misidentifying a set of antlers. This entry was posted in Backcountry, Deer hunting, Elk, Gear and tagged #deer season, backcountry, backpack, blaze, Deer, elk, gear, Hunt, Hunting, laws, orange, regulations, Review, rifle, sitka, technical, vest. Bookmark the permalink.